Almond production in Afghanistan has increased by over 20 percent on last year, but the price they fetch has gone down by over 40 percent, according to provincial officials, who have expressed concern for farmers' livelihoods. The northern province of Samagan produced over 1,000 tons of in-shell almonds this year compared with about 800 tons in 2008, Noor Mohammad, head of the provincial agriculture department, told IRIN. Agriculture officials in Balkh, Parwan and Daykundi provinces also reported increases in almond production. However, almond prices have fallen sharply. 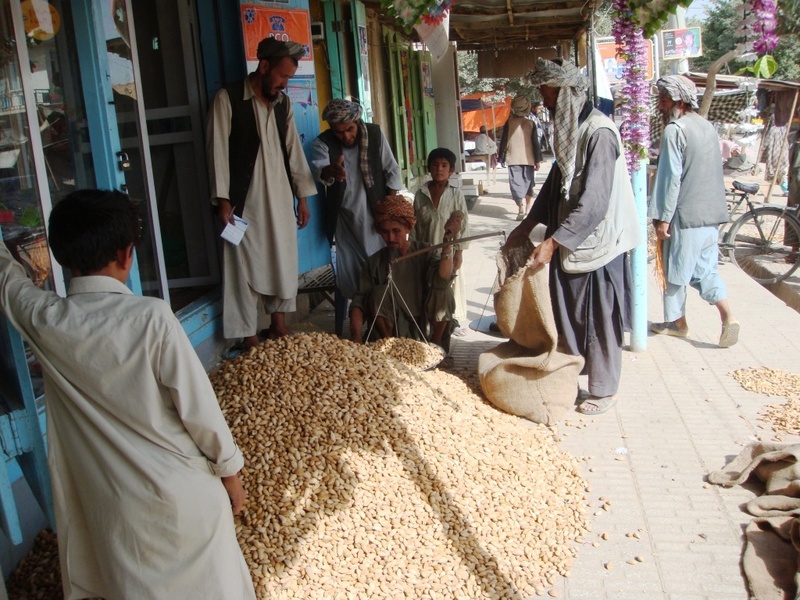 Abdul Fatah, a farmer in Samangan, said last year he sold one kilogram of in-shell almonds for 100 Afghanis [US$2]. "This year the price is down to 60 Afghanis," he said. Farmers in Samangan and Daykundi said low market prices directly affected their incomes and thus their ability to meet basic needs such as food and health care. "If I sell my almonds at 60 Afghanis [US$1.2] a kilo I will not be able to feed my family during winter," said a farmer in the central province of Daykundi. Mohammad Hussein, another farmer from Daykundi, told IRIN his 2,500 almond trees were damaged in the avalanches and floods in 2008, resulting in a very poor harvest last year. "This year production is good but the price is down," said Hussein, adding that the price of a kilo of almonds in Daykundi was 50 Afghanis ($1) - lower than elsewhere in the country. Hundreds of households depend on almond production in Samangan, Balkh, Parwan, Kunduz and Daykundi provinces. Dried fruit and nuts - such as almonds, raisins and pistachios - are among the country's major export earners, with annual exports worth about US$125 million, according to the government. About 40 varieties of almonds are grown, mostly in northern Afghanistan, according to a study by the Afghanistan Investment Support Agency. The country's annual almond production was estimated at over 38,700 tons in 2005, with exports worth $9.4 million (24 percent of all horticultural exports), the study said. Most Afghan farmers sell almonds in their shells or as kernels in local markets, albeit at low prices, but there is "excellent potential" for almond exports to grow, according to a Survey of Afghanistan's horticulture sector by the UN Food and Agriculture Organization (FAO). "Because of the lack of processing, packaging and marketing facilities at home, most of Afghanistan's high quality almonds and dried fruits are sold in international markets under other countries' brands," said Azeem Mustafa Hashimi, director of the Dried Fruits & Vegetables Export Promotion Agency. "If we had local processing and packaging plants for almonds and other dried fruits and directly exported products to foreign markets it would double the benefits for farmers and increase revenues for the government," said an experienced merchant in Kabul's dried fruit bazaar. The FAO survey said Afghanistan's climate was ideal for the production and development of the many types of almond grown in the country. But more investment was needed, said Hashimi.